"A wagon pulled by four mules, passing before a reviewing stand (not visible) on which President Harry S. Truman was sitting, during ceremonies marking the presence of President Truman in Bolivar, Missouri to dedicate a statue to Simon Bolivar (Rowe)." Before railroads and before mechanization of agriculture, the state of Missouri was famous for breeding mules. It still is. And the people who live there are proud of it. Telling someone that he is stubborn as a Missouri mule is not paying him a compliment ... unless he is from Missouri. President Franklin D. Roosevelt died in office and was succeeded by Vice President Harry Truman. 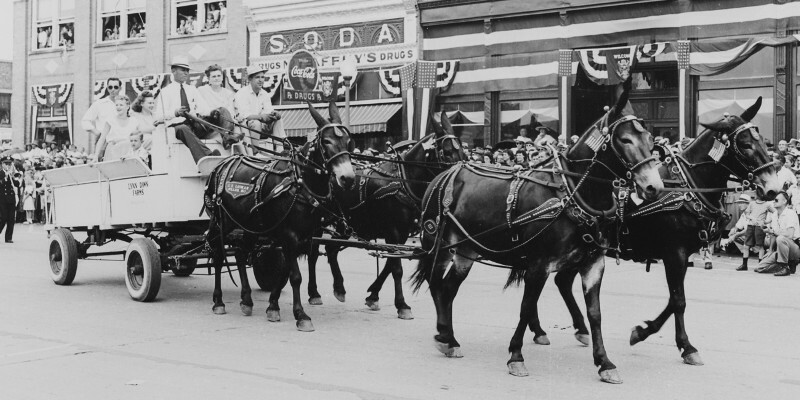 Truman, who came from Missouri, was elected to his own term in 1948 and brought a four-mule hitch to his inaugural parade (Missouri Mule History). A mule is a hybrid of a male donkey (a jackass) and a female draft horse (a mare). Mules have advantages over both parents. They are more sagacious, more disease resistant, and more efficient with regard to work produced in proportion to feed and water consumed. They are less prone to injury and can work harder over a longer useful lifetime (Wikipedia, Mule). Mules are sterile. Thus, if you need a supply of mules, you must keep handy herds of both draft horses and donkeys. Mules have been bred since antiquity, but in Missouri mule production is an outgrowth of the Spanish mule trade in Europe and the New World. This leads to two rhetorical questions: (1) How did mules come to Missouri? (2) Why did Missouri become the seat of mule production in North America? The answers to both lie in the history of the Santa Fe Trail. This document was inspired by a motorcycle trip I took in the fall of 2015. Normally, when I return from a trip, I arrange my memories amid the brochures I have collected and photos I have taken, and I wait for a story to gel. That didn't happen for me this time, or, if it did, the story was much too complex for a mere slide show. I couldn't use my photo-album layout as a matrix to support an analysis. Instead, the story demanded a synthesis of several themes -- a kind of knowledge in depth that I don't have. What to do? Mine Wikipedia, of course. If you look at my list of "Works Consulted" under "Cites," above, you'll see that's exactly what I've done even though my high-school English teachers would not have approved. Rhode, Charles. "Santa Fe Trail". 17 Sep. 2016. Lacus Veris. 24 Apr. 2019 <http://lacusveris.com/SFT/en/index.shtml>. Last modified 27 Apr. 2017. Served 5224 times between 17 Sep. 2016 and 24 Apr. 2019. Contact mailto:CRhode@LacusVeris.com?subject=Santa+Fe+Trail.